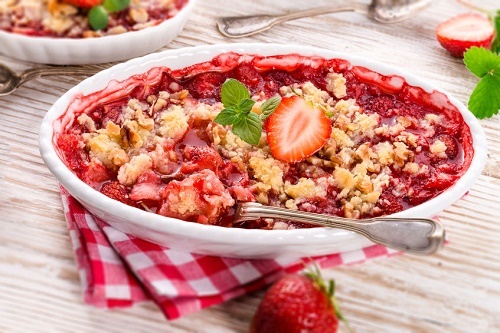 The sweet-tart taste of this crumble makes it summer in a bite. Top with a dollop of whipped cream or a scoop of vanilla ice cream. Preheat oven to 375 and line the bottom shelf of the oven with aluminum foil to catch drips. In a large bowl, mix the granulated sugar, ½ cup of brown sugar, 3 tablespoons of the flour, strawberries, rhubarb, cinnamon and nutmeg. Place mixture in a greased baking dish. In a separate bowl, mix remaining flour, remaining brown sugar, butter and oats using your hand or a pastry cutter. Crumble evenly across the rhubarb strawberry mixture and bake for 40 minutes, or until topping is crisp and lightly browned. This simple crumble recipe can be adapted to whichever fruits you have on hand. Try omitting the rhubarb and using diced peeled peaches, blueberries and raspberries instead. Stir in ¼ teaspoon of almond extract and the zest of one orange for an even brighter pop of flavor.